I met up with Kevin and Ivan last Thursday, skipping the Tiger film screening and Q&A as we had, after much struggle (I had to recover from the flu as well), finally arranged a session. It was important to meet them as they have been my internet kakis over the past couple of years and certainly made up for the demise of the mac meetups. Their community passion has meant ideas and encouagement and both are teaching as well! With Kevin in Singapore, it was just crazy not to meet. Face to face exchanges mean communication at speeds way beyond broadband - in this case even their facial expressions conveyed so much that ideas emerged just by watching them! "Meetup with Kevin and Siva." By Ivan Chew. Rambling Librarian :: Incidental Thoughts of a Singapore Liblogarian, 17 Mar 2007. 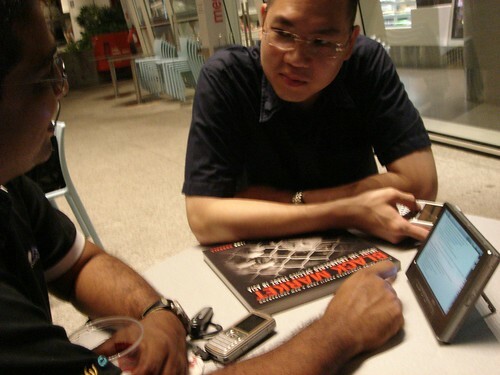 "The Bloggy Trinity: Siva, Ivan and Me…" By Kevin Lim. THEORY.ISTHEREASON, 16 Mar 2007. I have actually tried a couple of things as a result of the Thursday night conversation, but will only report later next week. I did get Twitter started, after Ivan thought my sms of yesterday afternoon was twitter'd. Twitter's casual role has certainly taken off immediately, with twitter-fans finding me much faster than I can blink! I'll write when I actually examine it for the reasons we discussed. I was a little light-headed on Friday after sleeping at 3am. Happily, in the afternoon at 2.30pm, I was scheduled to guide a cheerful and responsive group of Millenia Institute students at the Raffles Museum Public Gallery. I enjoyed that session very much even though I did not get to try out the trolley of curiosities as intended. Bright, alert and energetic after that and the second session, there was enough time to race over to the seminar on Genetic Time Travel - it was interesting and Ramakrishnan also discussed tigers, which made up somewhat somewhat for the screening I missed! I'd best be off to bed - I have to get up at 5.45am in order to join the Briskwalkers!